This innovative technique is revolutionizing the way people around the world receive dental implants. Dental implants are definitely the best option to help those with missing teeth. However, traditional implants are expensive and a very time consuming process often taking from 6 to 18 months to complete with multiple surgeries. 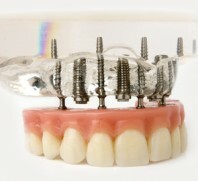 With same day implants you will not have to wait 2 to 6 months until you have teeth. On the day of your implant surgery you will leave the office with a temporary crown attached to your implant. One month later the permanent crown can be attached. Other than the dental implant cost, what is the difference between same day implants and traditional implants? First surgery-oral surgeon exposes the jaw bone and drills a 6 to 7mm hole to insert a 4mm titanium post. Waiting time of approximately 2 to 6 months until your bone grows around the post. Second surgery-oral surgeon exposes the tip of each post and attaches the crown. If a bone graft is needed another surgery would be needed before inserting the titanium post adding another 4 to 8 months of healing time. This is very common as traditional implants can only be inserted vertically. Under a light pain medication such as Ibuprofen and local anesthesia, the doctor will drill a 2.25 mm hole through the gum and jaw bone and insert a 4mm titanium post that is very similar to a screw. Once the post has been inserted she will place a temporary tooth on the post. Usually the process takes about 15 to 20 minutes. The inserted titanium post is very secure from the beginning but for the first month it is important to take care of the temporary tooth by not eating foods such as raw carrot, apples etc to allow the bone to fully attach to the post. In 30 days you can have your permanent crown in place. With tramonte implants if there is insufficient bone directly above the missing tooth. The implant can be set at an angle and relieve the need for bone grafting.